Casa, 3 habitaciones, 1 baño, cerca de todo. Remodel Home, para una gran familia o grupo, también es bueno para una pareja. los niños son bienvenidos estamos ubicados en una zona residencial, muy cerca de todo. 8 minutos de casa a la principal calle turística. playa también muy cerca, a unos 15 min. te encantará mi lugar es agradable y cómodo. Recientemente remodelar, nevera, microondas, cafetera, estufa, agua caliente, toallas y champú, WiFi, disponible. Aparcamiento privado con puerta, para más de un automóvil. busca nuestro precio especial de la semana. Right from the start Margarita and I kept in contact, answered all of my questions and kept me well informed. Welcomed us as soon as we arrived to her home and did a walk through of the house and how everything worked. The house was well organized, clean and had a lot of space. I loved that it was gated so we felt very secure and we were very happy it wasn’t too far away from our activities we had in place. The home is great for the price in my opinion. I think the only suggestions I would give would be to maybe spray bug killer around the exterior and interior of the home, it wasn’t bad but it would help and also maybe getting rid of the dirt lot, I’m my opinion I don’t like feeling like we are bringing dirt inside and it doesn’t feel clean taking a shower then stepping outside on the dirt. Other wise everything was so great and Margarita is such a wonderful person who is very helpful and easy to work with. I would most definitely stay here again. Thank You Margarita! LA casa esta muy limpia y grande el area es tranquila. La propiedad es ideal para grupos de 6 a 8 personas. Y una estadia de 3 dias o mas. Gracias Aurora por su ayuda. Great interior, nice set up for 5-10 people, awesome secure parking. Margarita was very attentive and accommodating, would definitely stay here again. We are very happy to say that our stay was very comfortable quite and we felt very safe the house was very clean and well stocked with all the basics when we decide to go to ensenada again we definitely want to stay there again.Our host and her Niece were very very nice to us and very helpful with any questions we had. I want to thank booth of them for everything. Nice home away from home, the house is as described. Comfortable and quiet. 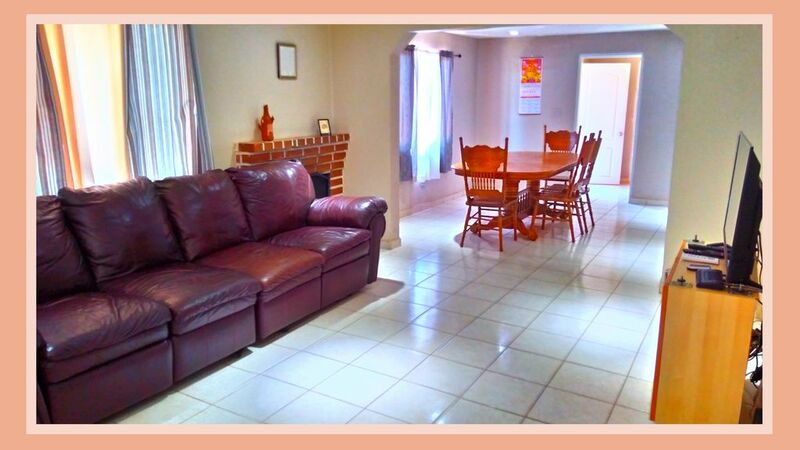 The house was comfortable and spacious, clean and gated, we felt safe and at home. Margarita is a good host and patiently provided instructions on how to arrive. The house is far enough from the hustle and bustle of the tourist area but close enough to be there quickly if you wanted. -Rates are subject to change until reservation is confirmed. -If the house is rented for more than 7 days it will be a charge of $20.00 to provide new towels and linen each time requested. -the price of rental will increase for more than 6 people, in order for a small group to be able to rent our property as the same as a large group. Due to increase of laundry and basic services the price will increase for large group to cover the usage.